Browsing articles tagged with " knee pain"
Dr. Jun Xu went to Leprosy village in 2013, 2014 and 2016, soon he will go to the leprosy village on March 31, 2017. 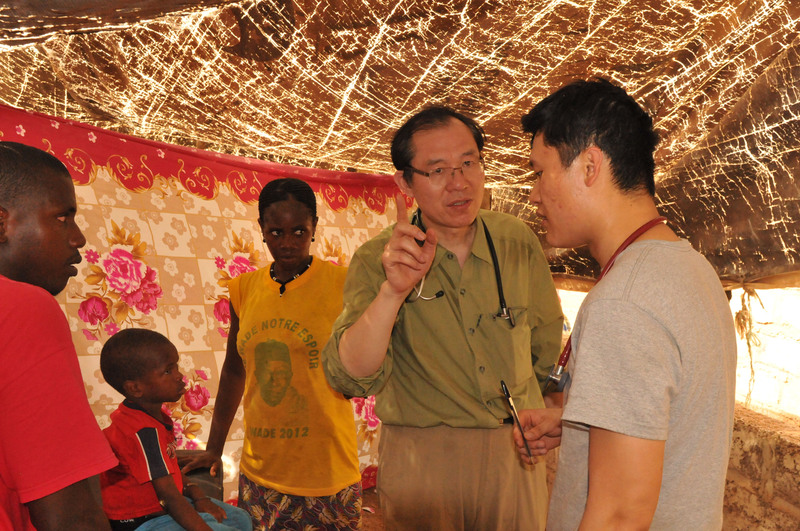 In 2013, there was no a single room being used for treatment in the leprosy village, Dr. Xu and his team had to use a tent. 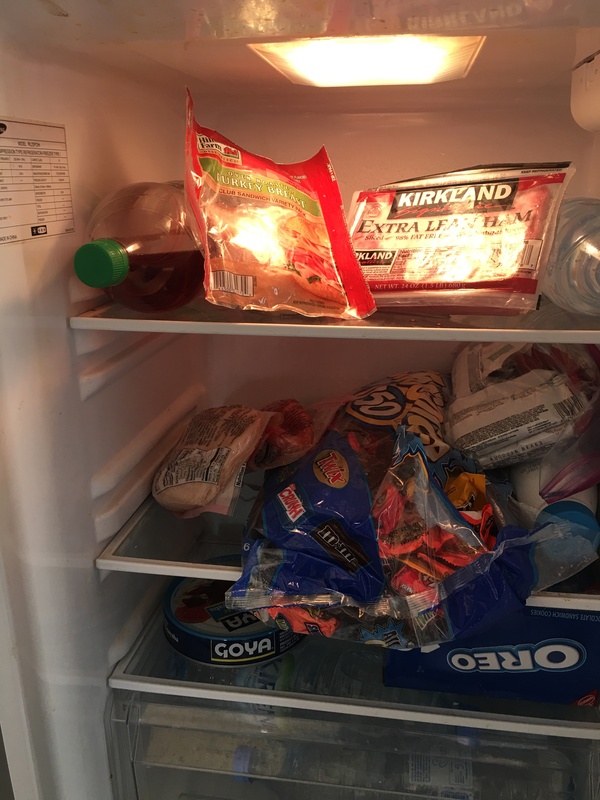 The temperature was around 125 Fahrenheit degrees. 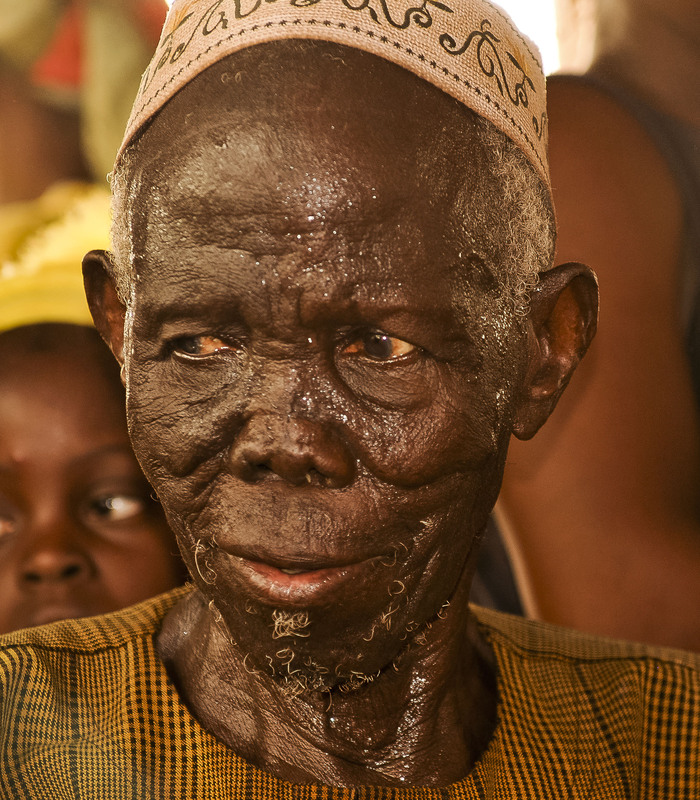 The leprosy patients were waiting for their turn to be attended. Dr. Jun Xu saw about 200 patients a day. 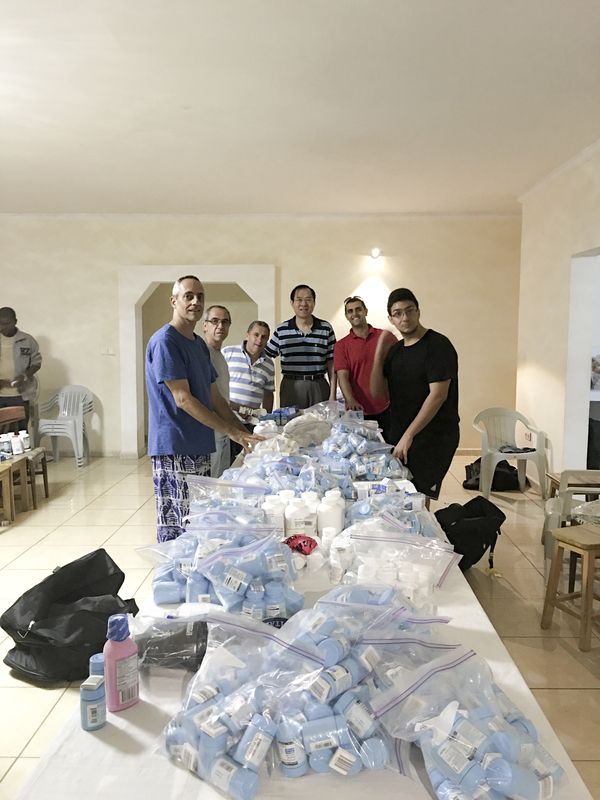 Every year, Dr. Jun Xu and his team bring around $300,000 worth of medicine donated from his team members and Americares in Stamford, CT to treat the leprosy and other patients in Senegal and Guinea Bissau. http://www.americares.org/, in 2017, his team also received medicine donation from Direct Relief in California, https://www.directrelief.org/. 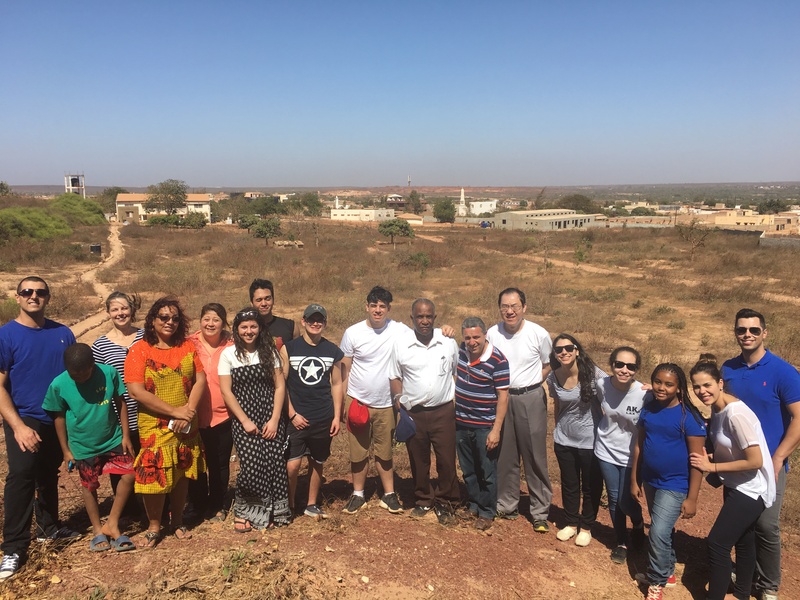 Dr. Jun Xu and his team finally established a clinic in the leprosy village, one building for the clinic, and another building for the living of doctors and nurses. 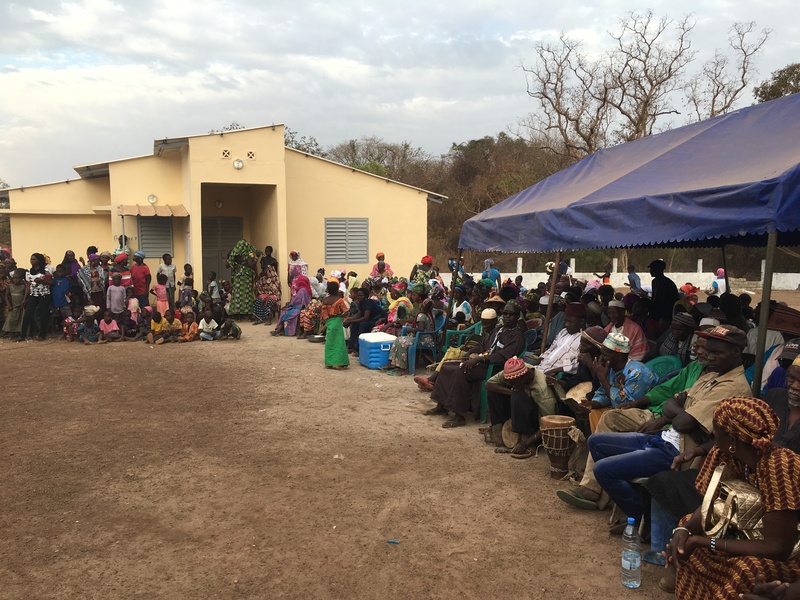 Leprosy village people were celebrating the opening of the clinic. 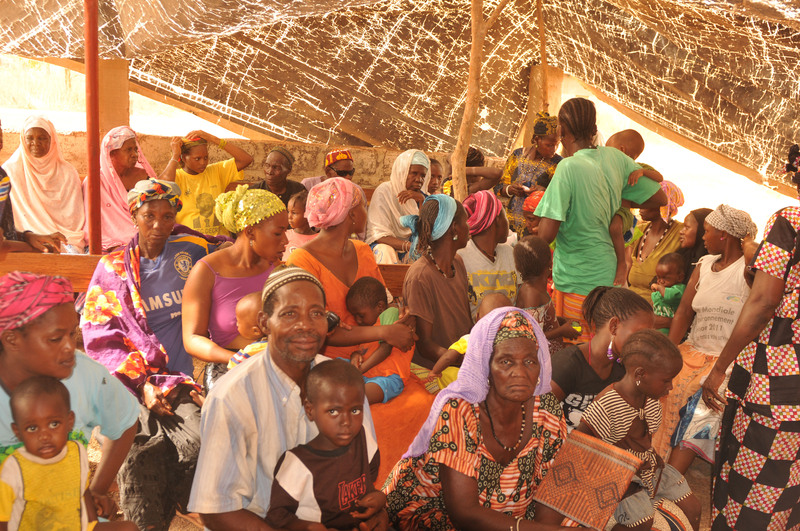 There are 8 wards, which could hospitalize the patients if it is medically necessary. Dr. Jun Xu’s team usually stay in Senegal for 10 to 14 days, these are the foods his team brought from US in order to keep them health and safe. They do not dare to eat street food. Dr. Jun Xu and his team from US in 2006. Jun Xu, MD, 1171 E Putnam Avenue, Riverside, CT 06878, USA. Dr. Xu promises that all your donation 100% will go to Senegal and his team will nerve use a penny from your donation. You will receive the tax deductible receipt. Any amount is a great help for Africa patients. Jun Xu, M.D. 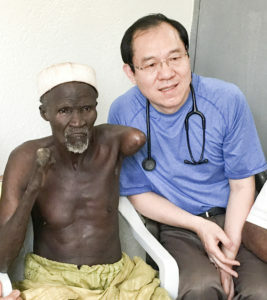 , Peter Zheng, M.D. Why did Tiger Woods receive PRP treatment for his knee and ankle pain? “I had PRP, platelet-rich plasma treatments, and basically, what that is, is they draw blood from your arm, spin it in a centrifuge, and take the plasma out and insert it into the injuries. Well, as you all know, in 2008, I blew out my ACL. And part of my reconstruction of my LCL wasn’t reacting properly. It was a little bit stuck, and so I had the PRP injection into my LCL. Did the PRP help Woods? Many famous athletes — including Tiger Woods, tennis star Rafael Nadal, and several others, such as Fred Couples, Alex Rodriguez, Tracy McGrady, Chris Canty, Kobe Bryant, and Cliff Lee, have received PRP for various problems, such as sprained knees and chronic tendon injuries. 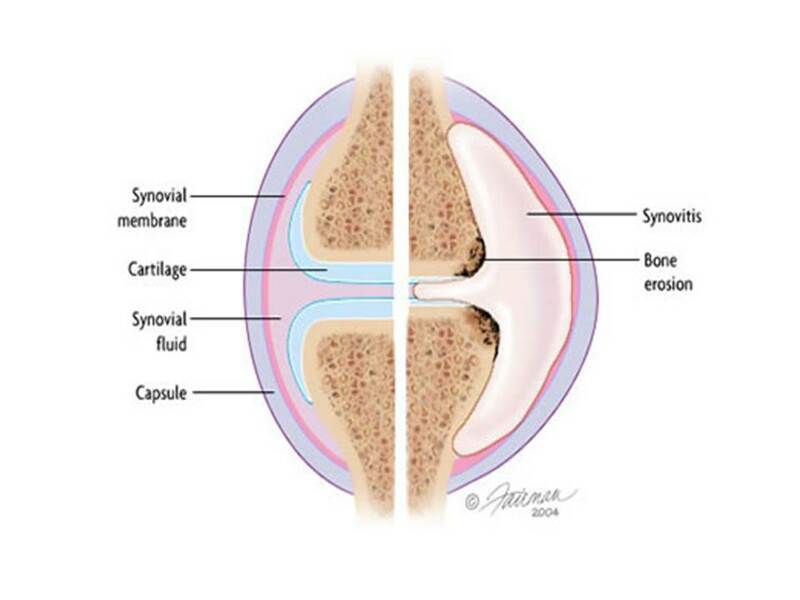 These types of conditions have typically been treated with medications, acupuncture, physical therapy, or even surgery. Many athletes have credited PRP with their being able to return more quickly to competition. What exactly is platelet-Rich plasma? What conditions are being treated with PRP? As you know, blood contains mainly liquid (plasma) and small solid components (red cells, white cells, and platelets.) The platelets are best known for their importance in clotting blood. 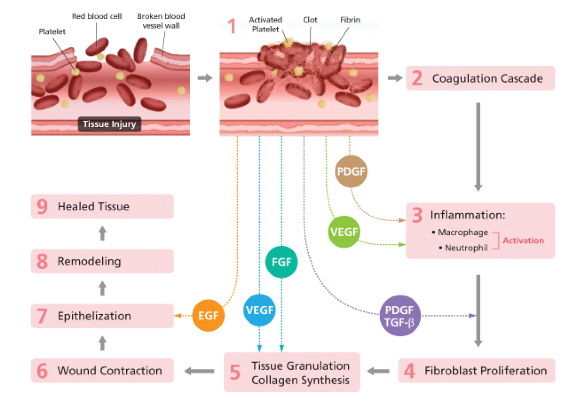 However, platelets also contain hundreds of proteins called growth factors which are very important in the healing of injuries, such as synthesis of collagen, growth of cartilage, production of tendon and fibers, and induction of blood vessels, etc. PRP is plasma enriched with high concentration of platelets and growth factors — can be 5 to 10 times greater (or richer) than usual by PRP centrifuge procedure. Then the increased concentration of platelets is injected to the injury sites of human body. 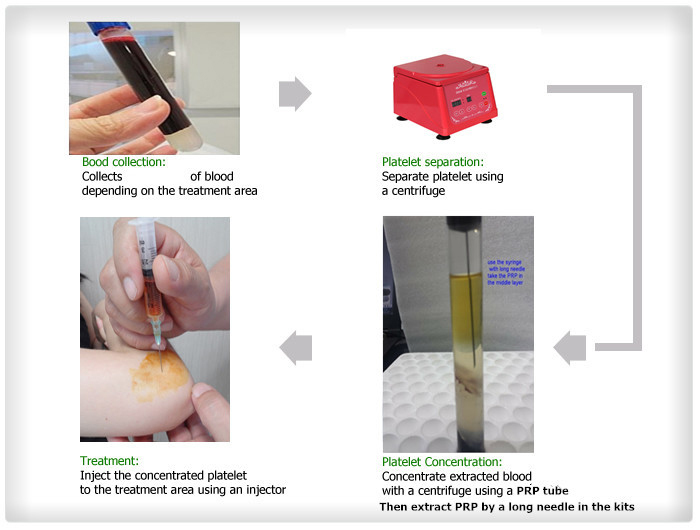 The following figures explained how the PRP is made from. Although it is not exactly clear how PRP works, many researches have shown that the increased concentration of growth factors in PRP can potentially speed up the healing process. 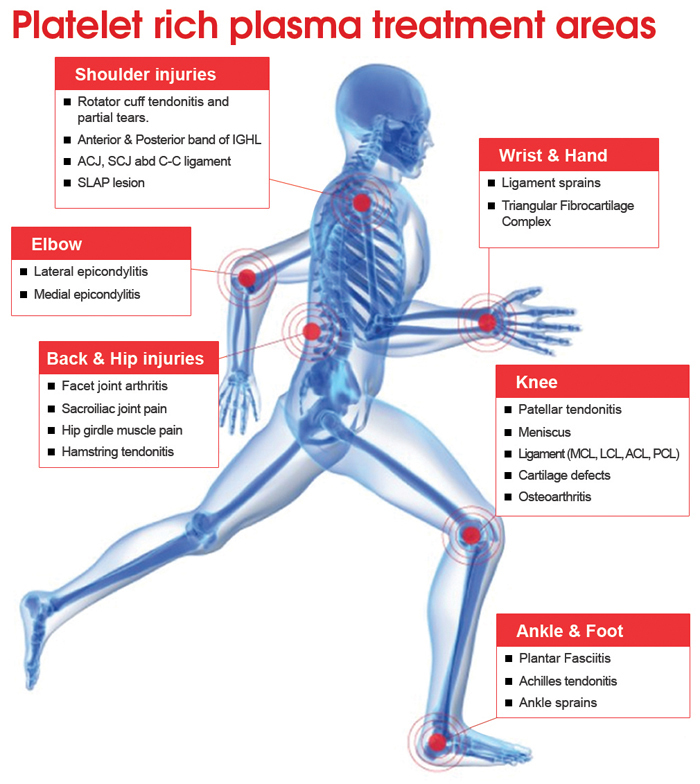 To speed healing, PRP is carefully injected into the injured area. For example, in Achilles tendonitis, a condition commonly seen in runners and tennis players, a mixture of PRP and local anesthetic can be injected directly into the heel cord. 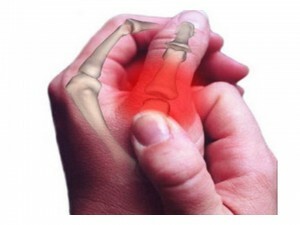 Afterwards, the pain might be reduced and the injured tissue might quickly heal within one or two months. What Conditions are treated with PRP? Is It Effective? PRP is most effective in the treatment of chronic tendon injuries, especially tennis elbow, rotator cuff , bicipital tendonitis, wrist tenosynovitis , and iliopsoas tendonitis. The use of PRP for other chronic tendon injuries — such as chronic Achilles tendonitis or inflammation of the patellar tendon at the knee (jumper’s knee) showed strong evidence that is clinically very effective. 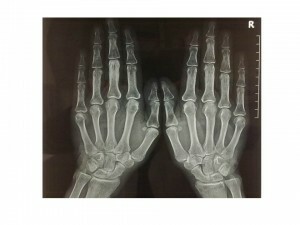 Research has being done to evaluate the effectiveness of PRP in the treatment of the arthritis. The preliminary data supports PRP is an excellent option to treat different osteoarthritis, such as knee, shoulder, hip and hand. Much of the publicity PRP therapy has received has been about the treatment of acute sports injuries, such as ligament and muscle injuries. PRP has been used to treat professional athletes with common sports injuries like pulled hamstring muscles in the thigh and knee sprains. Recently Kobe Bryant went to Germany for PRP treatment. http://grantland.com/features/kobe-bryant-dr-chris-renna-regenokine-knee-treatment/. 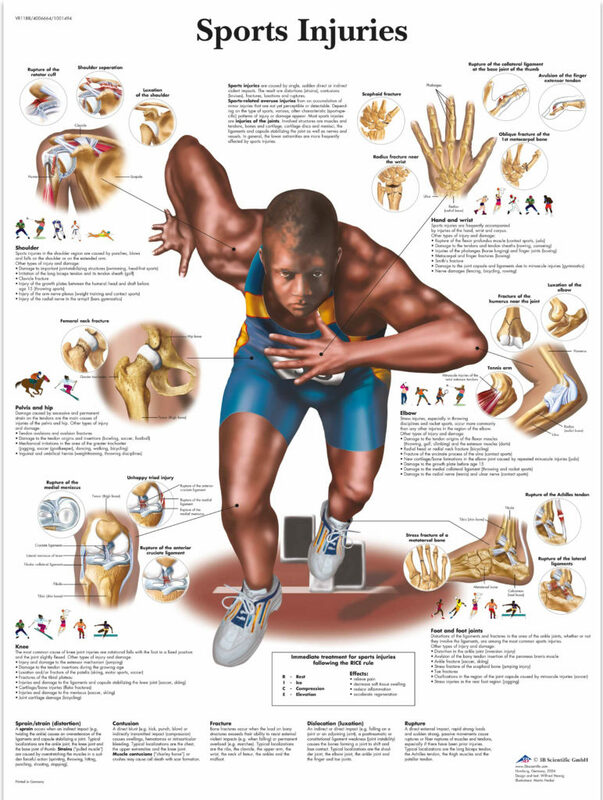 All the clinical data indicated it might work on the acute sport s injury. More recently, PRP has been used during certain types of surgery to help tissues heal. 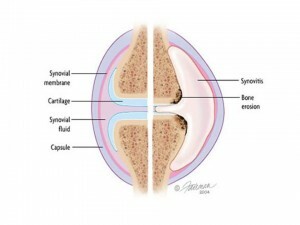 It was first thought to be beneficial in shoulder surgery to repair torn rotator cuff tendons. However, the results so far show little or no benefit when PRP is used in these types of surgical procedures. Surgery to repair torn knee ligaments, especially the anterior cruciate ligament (ACL) is another area where PRP has been applied. At this time, there appears to be some benefit from using PRP in this instance. PRP has been used in a very limited way to speed the healing of broken bones. So far, it has shown no significant benefit. Treatment with PRP opened a new way to cure your pain. 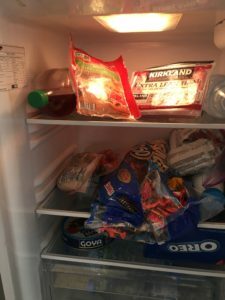 There is much evidence to support this new technology. For all the acute and chronic tendonitis, osteoarthritis, and other pain diseases, we are comfortable to treat with PRP. We have already equipped with state of the art instruments to embrace this new wave. We also received intensive training to perform this new therapy. You are welcome to give us a call to discuss about the benefits and side effects regarding PRP treatment. Acupuncture and physical therapy are good therapeutic methods before you try PRP treatment. If you tried all the non-invasive treatments, PRP might be your next option. The risks associated with PRP are minimal: There may be some pain at the injection site, but the incidence of other problems — infection, tissue damage, nerve injuries — appears to be no different from that associated with cortisone injections. By the way, please be advised that few insurance plans provide even partial reimbursement. 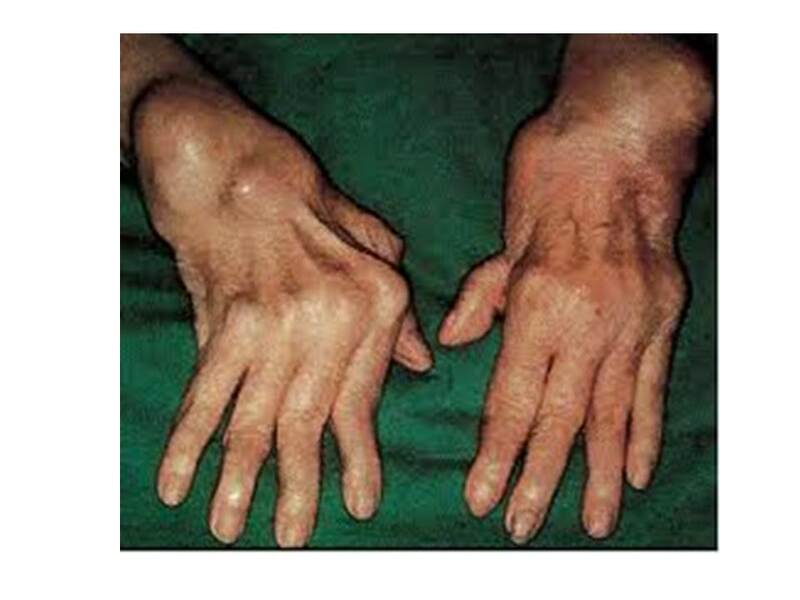 Helen is a 46 years old female, who complains of pain all over the body for about one year. Her husband lost his job about one year ago and has tried his best to find one. However, he has had no such luck. 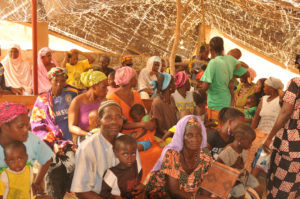 Helen started to worry about her family financial situation and very often could not sleep well. She always feels sluggish as sleep is not replenishing her energy. She wake up feeling very stressed out and moody and worrying about everything. She gradually developed pain all over the body, feeling tenderness at symmetric points, such as neck, upper back, shoulders, elbows, middle back, low back, hip, knee and calf. The pain is getting worse, now even moderate touch could make her feel pain. She was forced to move out of her house because she was unable to pay her mortgage and moved in an apartment recently. This made her symptom worse, she went to her primary care physician, who checked her blood work, chest x-ray and EKG, all were normal, and prescribed Ambien and pain medication, such as Oxycodone, she felt temporarily relief, however, she had constipation, headache, sometimes diarrhea, felt very tired when waking up. Because the symptoms were getting worse, therefore, she came to me for evaluation and treatment. Upon examination, she looked very tired and fatigue, spoke with a low tone, she was found to have many tender points along the spine, chest ribs, shoulders, elbows, hips and knees, when she was touched by my fingers. 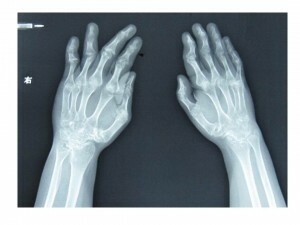 This patient might have fibromyalgia, a common syndrome, most often occurring in middle age women. Symptoms are long-term, body-wide aches, pains and tenderness. Typically symmetric in the joints, muscles, tendons, and other soft tissues, very often with accompanying fatigue, depression, insomnia, and anxiety. Genetics: the mode of inheritance is currently unknown, but it is common to see patients in one family, especially mother and daughter. Stress: an important precipitating factor, Fibromyalgia is frequently found with stress-related disorders, such as chronic fatigue syndrome, posttraumatic stress syndrome, irritable bowel syndrome, and depression. Among the above possible causes, the most important are stress and poor sleep, stress and poor sleep make a noxious cycle: Stress causes poor sleep, poor sleep enhances stress, both stress and poor sleep make muscles unable to relax, for a long time period, the muscles nerve get chance to relax, then it twists together and forms the tender points and bends, which are symmetric and long term. Fibromyalgia is most common among women aged 20 to 50. Widespread pain, fatigue, and severe pan in response to light pressure, numbness and tingling sensation, muscle spasm and weakness in all 4 extremities, nerve pain, muscle taut band, twitching, chronic sleep disturbances, and irritable bowel syndrome. Fibromyalgia patients tend to wake up with body aches and stiffness, pain improves during the day and gets worse at night. Some patients have pain all day long. Pain may get worse with activity, cold or damp weather, anxiety, and stress. Fatigue, depressed mood, and sleep problems are seen in almost all patients with fibromyalgia. Many say that they can’t get to sleep or stay asleep, and they feel tired and stiffness when they wake up. Many patients experience impaired concentration, poor memory, inability to multi-task, poor attention span, anxiety and depression. The American College of Rheumatology preliminary diagnostic criteria for fibromyalgia New Diagnostic Criteria and measurement of symptom severity. Arthritis Care Res (Hoboken). 2010 May;62(5):600-10. The new criteria keep the requirements that other causes be ruled out and that symptoms have to have persisted for at least 3 months. They also includes 2 new methods of assessment, the widespread pain index (WPI) and the symptom severity (SS) scale score. 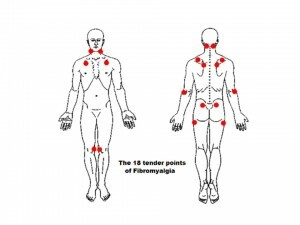 The WPI lists 19 areas of the body and you say where you’ve had pain in the last week. You get 1 point for each area, so the score is 0-19. The numbers assigned to each are added up, for a total of 0-12. This next part is really interesting to me. Instead of looking for a hard score on each, there’s some flexibility built in, which recognizes the fact that fibromyalgia impacts us all differently, and that symptoms can fluctuate. WPI of 3-6 and SS scale score of at least 9. Physical Therapy is aimed at treating the disease consequences of fibromyalgia including pain, fatigue, deconditioning, muscle weakness and sleep disturbances among others. 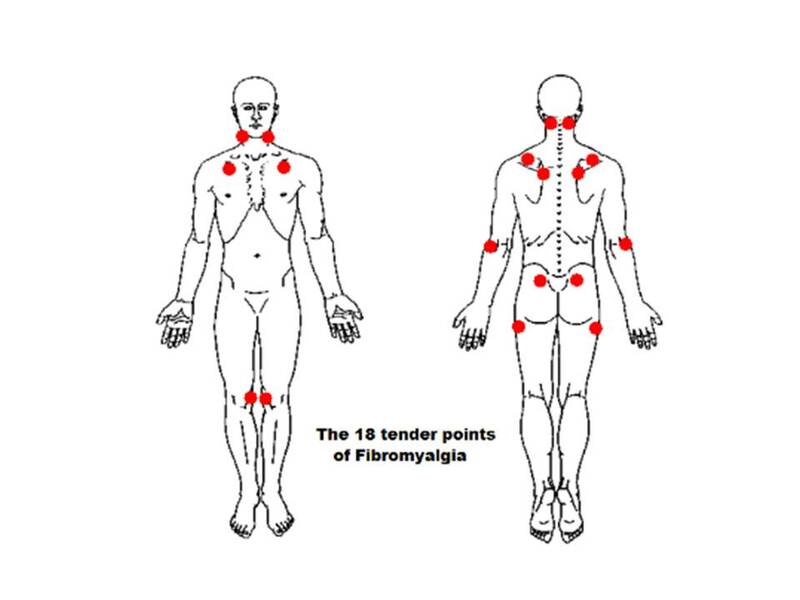 Modalities such as ultrasound and TENS machines will help reduce localized and generalized musculoskeletal pain in fibromyalgia patients. Massage is great to reduce muscle tension and spasms which prevent efficient muscle motion. 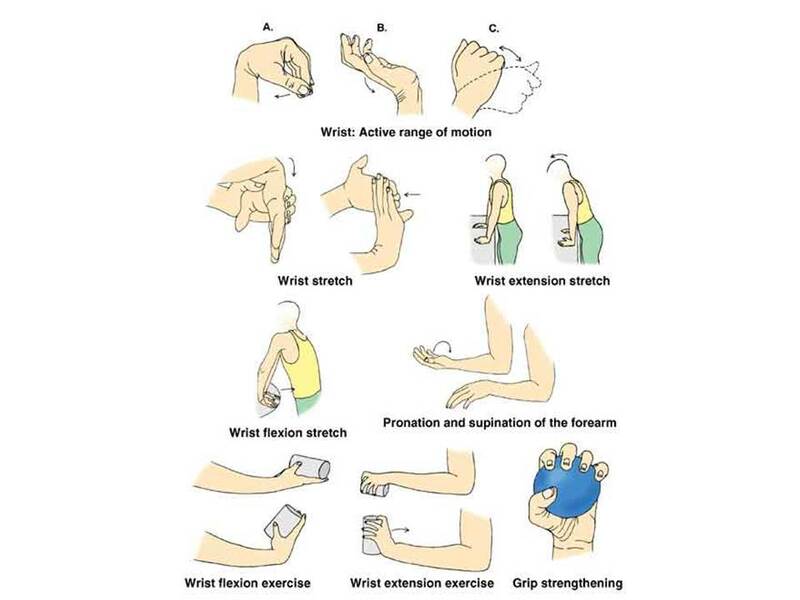 Techniques such a joint mobilizations and deep tissue massage prescribed with other therapeutic interventions such as stretching will help your muscles more effectively. Physical Therapy consult is very beneficial to address sleeping disturbances affecting about 80% of all patients. Positioning while sleeping and relaxation techniques prior to sleeping can help correct this serious problem. Fitness machines such as exercise bikes or elliptical machines will improve important measures of cardiovascular fitness, subjective and objective measures of pain. Also improving is subjective energy levels, work capacity along with physical and social activities. Focusing on core stability will reduce overloading of the muscle system by supporting the muscles of your spine. There is a great impact on conditioning weak muscles for improving postural fatigue and positioning. With a strong core, your body will have a stable, center point. There is great evidence based research for Whole Body Vibration use on patients with fibromyalgia. A 6-week study published in 2008, in The Journal of Alternative and Complementary Medicine, by Alentorn-Geli et al reports that WBV safely reduces pain and fatigue while also improving physical function in patients with fibromyalgia. Here at Rehab Medicine & Acupuncture Center, we have been using this evidence based device in successfully treating symptoms of fibromyalgia. Another study looking at the benefits of WBV with fibromyalgia performed by Sanudo et al in 2010 was published in Clinical and Experimental Rheumatology. This study examined women with fibromyalgia performing exercise training 2 times a week along with WBV three days a week compared with an exercise only group over a 6-week period with a focus on strength and quality of life. Significant improvements in all outcomes measured were found from baseline in both groups though additional health benefits were observed with the supplementary WBV. The second line of treatment is medications, such as antidepressant or muscle relaxant in order to improve sleep and pain tolerance, Duloxetine (Cymbalta), Pregabalin (Lyrica) and Milnacipran (Savella) are very often prescribed. 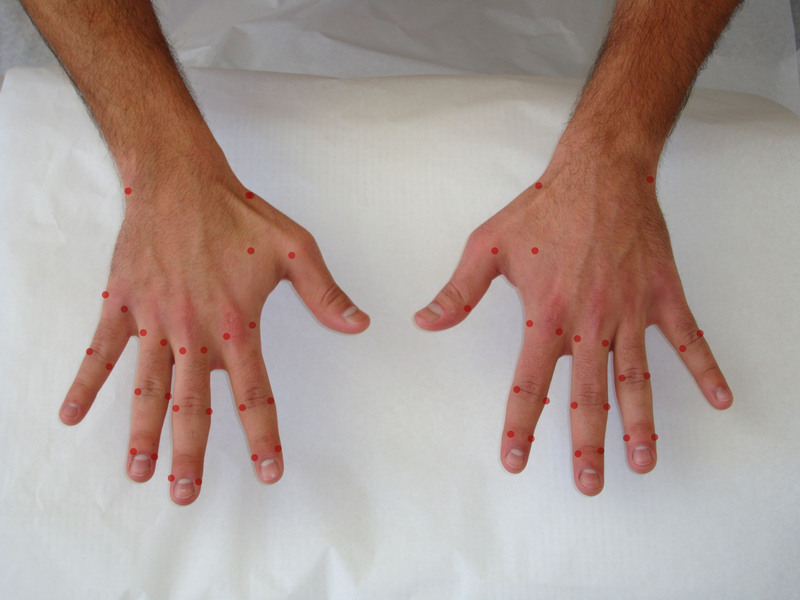 Acupuncture points mainly are selected from meridians of Tai Yang and Sao Yang, plus cupping. 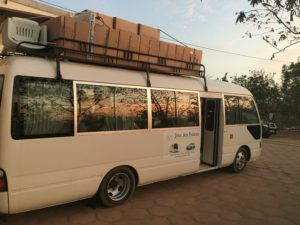 UB9 Yuzhen, UB16 Dushu, UB18 Ganshu, UB23 Shenshu, Ren6 Qihai, Du20 Baihui, GB13 Bensheng, GB21Jianjin, GB34 Yanglingquan, LI15 Jianyu, ST 36 Zusanli, Sp8 Diji, Ki8 Jiaoxin, UB59 Fuyang, Arshi, etc. 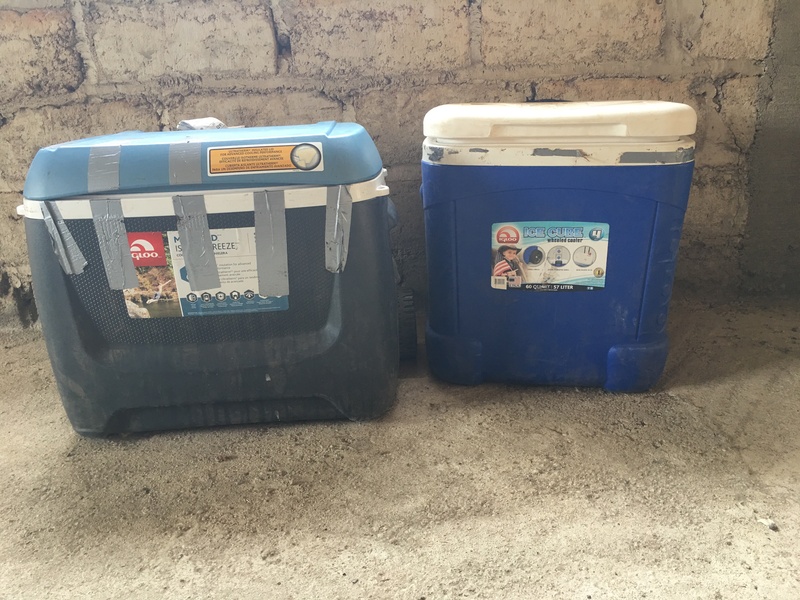 Helen underwent our treatment about 3 months. I first helped her improve her sleep. According to Chinese Medicine, the key factor was sleep, if the patient can have better sleep, her noxious cycle will be broken, and along with her improvement of sleep, her muscles was gradually relaxed and her pain was gradually reduced. 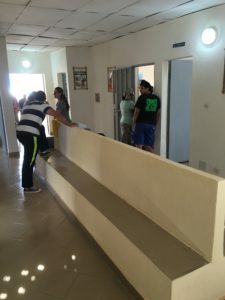 She also was encouraged to have physical therapy to improve her functional abilities and join the entertainment activities, she had difficulty playing tennis at beginning, after a few treatments, her performance of tennis was getting better, and after all the treatment for three months, her pain is almost gone and quality of life is much better. Keep a peaceful mood, and you have to realize that your worrying does not take away your stress, but adds stress to you. Try to get a good sleep nightly, take hot shower before go to bed and avoid TV in order to have a nice sleep routine. Massage sleep points 5 mins before you go to bed. Try to help patients to have good sleep by selecting Baihui, An Mian, etc. Try to help patients to have stress reduction by selecting Shen Men, Shen Shu, etc. 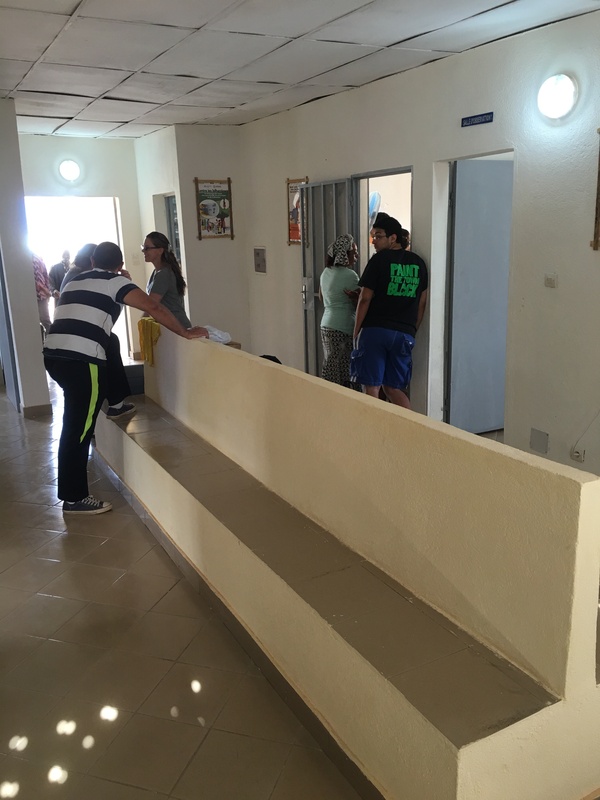 Encourage patients attend all the activities. Cupping along UB meridian is very helpful.